Set a date for adventure with The Adventurer's Almanac! An entire year's worth of adventure awaits you inside its pages, complete with magical items, interesting personalities, strange festivals, and dangerous sites to explore all presented in a system-neutral format suitable for any fantasy campaign. 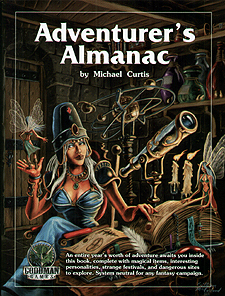 The Adventurer's Alamanc also includes a fantastical calendar to bring structure to your game seasons, loaded with more than 300 adventure seeds and a complete astrological system that gives characters personality traits, interesting benefits, and troublesome disadvantages to contend with. Don't let time run out on your campaign. Get the Adventurer's Alamanac today!